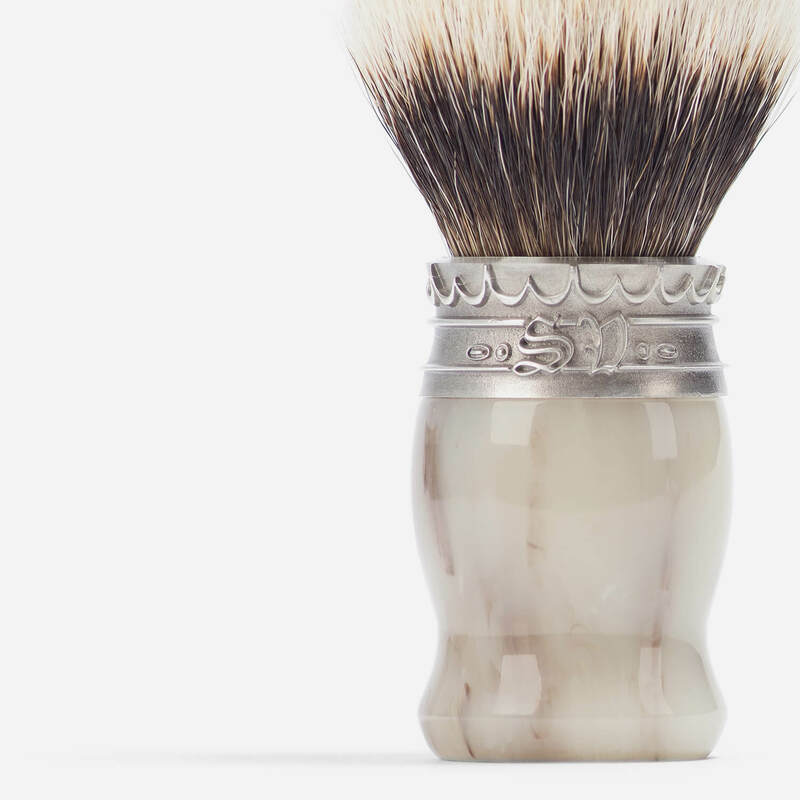 Handmade shaving brush filled with two-band white badger hair and featuring a faux horn solid resin handle topped with a pure pewter crown ring. 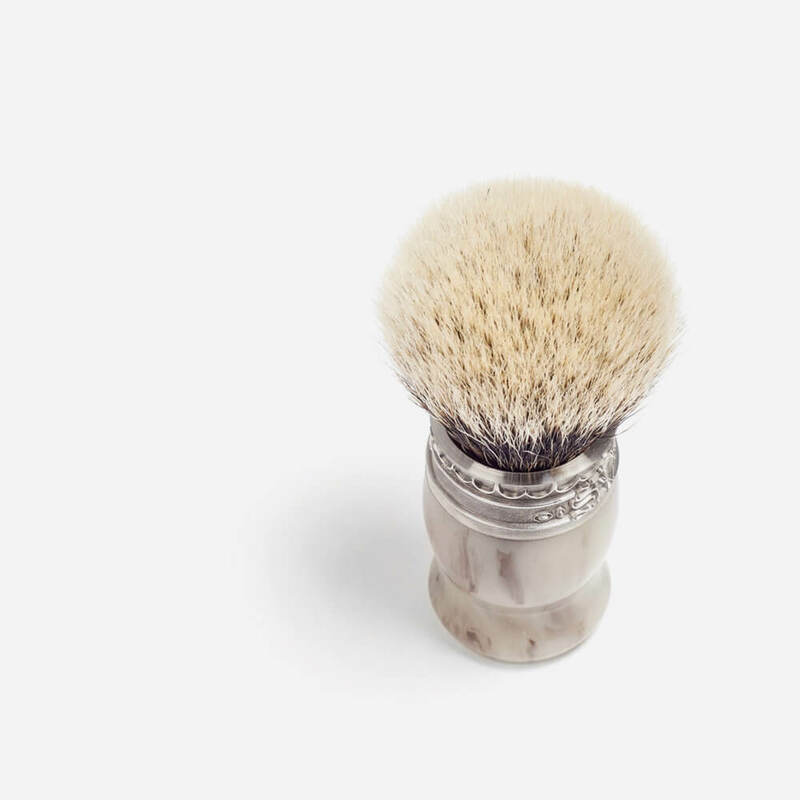 This Italian handmade shaving brush from Saponificio Varesino is filled with a large knot (26mm x 50mm) of two-band High Mountain White Badger hair housed in a faux horn solid resin handle. The handle is topped with a handmade natural pewter crown featuring the “SV” (Saponificio Varesino) initials. The brush is really unbelievable and has a truly stunning presence. The hairs you touch and feel them starting from the bottom of the knot and going up towards the tips, and it is the only brush in which I have felt as if I am touching real silk. The knot overall is highly luxurious and softness takes precedence over anything else. Free loft is 50mm but the brush has medium backbone and the net result is you feel as if you are holding a brush with much longer loft. 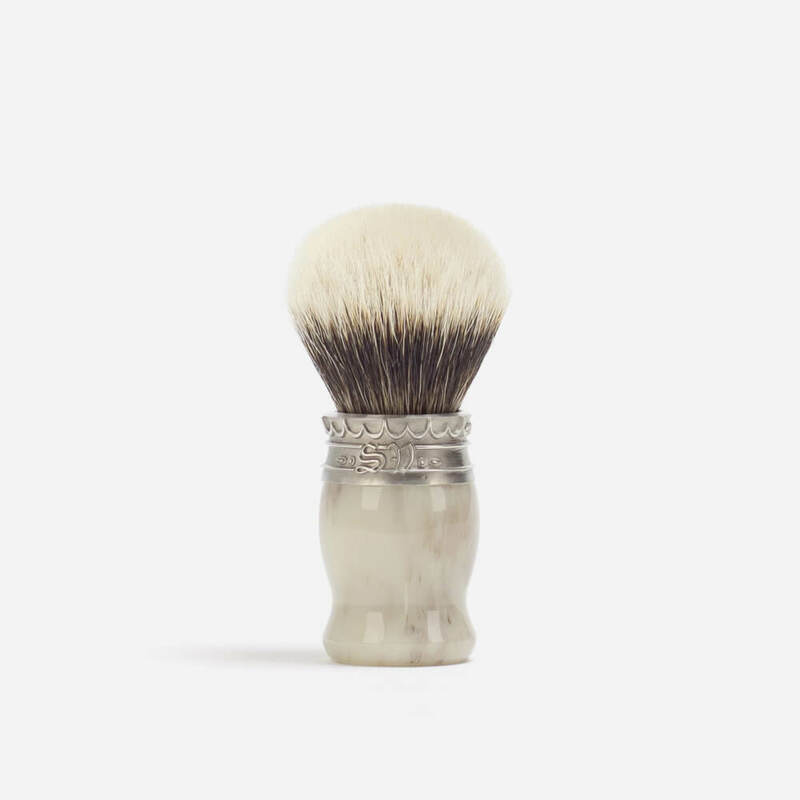 The backbone level makes this brush an all-rounder, today I used it for face lather with a soft artisan soap but I am sure it can do bowl lather fine after loading from a hard soap puck. The knot retains a large amount of water, at the end of the shave I squeezed it and lot of water came straight out. However the way the knot is managing that water, i.e. water flow through, is superb (initial first impression). The handle and the brush as a set will shock you when you first hold it in your hands. Areas of potential improvement include the comparatively poor packaging (by manufacturer SV), and the tin/aluminium/plastic collar which can scratch you if you ever want to put directly on your face some of the lather that collects there.